When you’re in the middle of a breakup, it can be hard to separate your new life from the old one―but doing so is vital if you want to create a happy future. Disconnecting from your old partner, and your old life, doesn’t have to mean walking away and never engaging with them again. Instead, “disconnecting” means unplugging yourself from any and all thoughts, emotions, activities, people, possessions, and other entanglements from your old life that no longer serve you, and creating new ones that bolster your vision for a better future. The best way to do this is simply to take a deep breath, steel yourself, and pull the plug―in your head, and in your heart. You have to choose, finally and irreversibly, to step into an unknown future and give yourself a chance to grow, thrive, and be happy again. Take out your calendar and place a star (or another symbol that has meaning for you) over today’s date. This is your Moment of Disconnection, your “Zero Point,” the place of transition. Starting today, your task is to reconnect to yourself 100 percent. From today on, no matter how hard it might feel, you are living your new life, not your old one. Look at the graphic below. Visualize yourself walking down a new road―the path to your future. 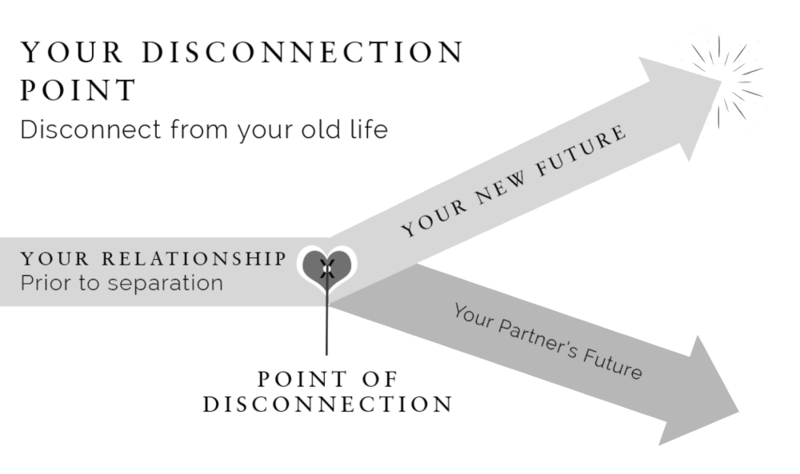 You are diverging from your ex-partner’s road and heading off in a new, exciting direction. See yourself as strong, vibrant, and prepared to walk this new road, wherever it leads. Now, take out your notebook and draw your own version of your Disconnection and your diverging road. On the top road, write your name. This is your road. On the lower road, write the name of your ex-partner. This is his or her road now. Alongside your new road, write down all of the good things you are taking with you―like happy memories, your children, and all the positive things you’ve learned and grown from. These things still belong to you. They are part of you, and will accompany you on your new path. You are not leaving yourself at your Point of Disconnection; you are simply leaving the life you used to live. Once you have finished your list, close your eyes, take a deep breath, and see yourself stepping away from that Point of Disconnection and onto your new road. See the road opening up in front of you, like a highway into the future. Even if you can’t see clearly where it leads right now, feel the possibilities for your new life. You must go through this process of Disconnection even if you are hoping to get together with your partner again at some point in the future. You will never feel empowered if you are constantly waiting for your ex to “remember” you and the way things were, or if you keep trying to change yourself to be the person you think your ex wants. Diverging from your old life can be hard, but it’s vital if you want to create a positive separation and a happy, empowered future. When you draw that hard line between now and then, you can make new and better choices, work more productively with your emotions, and live for today―not yesterday. Draw your Diverging Path from the exercise above every day for 5 days. See yourself walking confidently toward your new life. Step into your new life. Make a line on your floor with newspapers, tape, or a ribbon. When you mark your Disconnection in your planner, close your eyes, take a deep breath, and literally step over the line into your new life. Cuddle yourself. Take a soft, warm jumper out of the cupboard, put it on, and snuggle up on the sofa with a cup of tea. Give yourself permission to be still.